1,734 people read this post. On the twenty seventh of Rajab the Musjids will be full. People will gather to listen to talks being delivered regarding the great incident of Me’raj. After the talks are over, by and large we return home with the miracle of Me’raj and its message forgotten until the following year. Unlike us, the Sahaabah (radiyallahu anhum) and the Tabi’een (those who came after the Sahaabah) never set aside any particular day for the discussion of the incident of Me’raj. Hence even the scholars of the first century differed with regard to the actual date when Me’raj occurred (see Fathul Bari, vol.7, pg.203 and Ruhul Ma’aani, vol.15, pg.6). The Sahaabah (radiyallahu anhum) and the Tabi’een (rahimahumullah) had no need to set aside any particular day for this discussion. They regularly and frequently discussed the Ahadith with regard to all aspects of the life of Rasulullah (sallallahu alaihi wasallam). They lived the message of Me’raj every day of their lives. While there are many aspects that are related to Me’raj, the most important thing that pertains to us daily is the gift that was granted to Rasulullah (sallallahu alaihi wasallam) on the occasion of Me’raj. When Rasulullah (sallallahu alaihi wasallam) proceeded to the seven heavens and beyond and met His Rabb, Allah Ta’ala, he was granted the gift of Salaah. 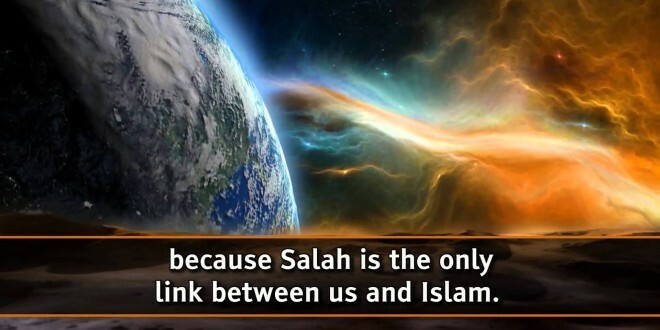 Such was the importance of Salaah that its injunction was not revealed while Rasulullah (sallallahu alaihi wasallam) walked on the earth. Rather it was saved for this special occasion beyond the seven heavens. Rasulullah (sallallahu alaihi wasallam) also greatly explained its importance throughout his life – to the extent that his parting advice when he left this world was with regard to upholding the injunction of Salaah. When we gather to discuss the occasion of Me’raj, we should take stock of our Salaah – the gift of Me’raj. Firstly, am I performing my five Salaah daily? Do I commence my day with missing Fajar? Do I remember the gift of Me’raj at the time of Fajar? At the time of Fajar do I remember the impassioned plea of Rasulullah (sallallahu alaihi wasallam) as he parted from this world with regard to upholding the injunction of Salaah? The same should be considered with regard to Zuhar and Asr – when the tills are ringing and with regard to Maghrib and Esha when other distractions are in the way. Furthermore how do I perform my Salaah? Is it in the manner that Rasulullah (sallallahu alaihi wasallam) performed it or is it performed haphazardly and in extreme haste? Have I gained concentration in Salaah? Also, do I perform it with Jamaat (which is waajib for adult males) in the Musjid? Rasulullah (sallallahu alaihi wasallam) is reported to have said: “By that Being who has control over my life, I intend asking the youngsters to gather some firewood. I would then instruct somebody to call out the Azaan and perform the Salaah while I go and set fire to the homes of those people who perform their Salaah in their houses without any proper excuse” (Abu Dawood #549/Ahmad #8903). Abdullah bin Mas’ood (radiyallahu anhu) says: “The one who wishes to meet Allah Ta’ala as a Muslim on the Day of Judgement should be punctual in the performance of his Salaah on hearing the Azaan. Allah Ta’ala has prescribed the clear ways of guidance for His Rasul (sallallahu alaihi wasallam). These Salaah too are among those ways of guidance. If you too will adopt the way of those who perform their Salaah at their homes, you will be abandoning the way of Rasul (sallallahu alaihi wasallam), hence you would be led astray. The one who performs wudhu and leaves for the Musjid, for every step he takes he gets one reward, one of his sins are forgiven and his stages are elevated in Jannah. In the time of Rasulullah (sallallahu alaihi wasallam) only an open hypocrite would not join the Jamaat. Even a sic k person would be carried by two people and brought to the Musjid to perform his Salaah with Jamaat” (Muslim #654). Salaah is not only an injunction of Allah Ta’ala and a responsibility and duty upon His servants, it is also a means of acquiring one’s worldly needs. It is a means of averting calamities and hardships. It is reported in a Hadith that whenever any matter perturbed Rasulullah (sallallahu alaihi wasallam) he immediately resorted to Salaah (Abu Dawood #1321). The Sahaabah (radiyallahu anhum) sought the solution to any problem by first resorting to Salaah. When discussing Me’raj, we need to take stock of how much we resort to the gift of Me’raj to solve our problems and difficulties. While there are many reasons for the present pitiful condition of the Ummah throughout the world, one of the main reasons is the neglect of this fundamental injunction of Deen. While our conferences, summits, workshops and seminars may come up with many worthy resolutions, it is of prior importance that an all out effort is made to bring the entire Ummah onto the punctual performance of the five daily Salaah (in the correct manner with all its etiquette being observed). Without this it will be wishful thinking to expect the degradation of the Ummah to change for the better. With the proper fulfilment of Salaah and all the other injunctions of Deen, the help of Allah Ta’ala will be with us. Then minimal effort will make us victorious and gain us the best of both worlds.